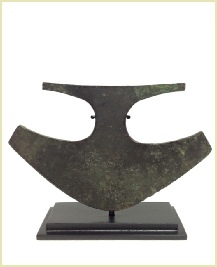 An excellent Inca copper Axe. Symmetric in shape, having a T-form hafting base and curved blade. Refined copper axes were produced for higher status individuals. Common utilitarian axes or hachas used in battle were usually made of stone (champis). Blade edge bares evidence of use. Peru, Late Horizon, 1476-1534 AD. Measures: 6.5”/16.51 cm in width. 4”/10.16 cm in height. Complimentary custom stand included. Similar samples are published in “Cobre del Antiguo Peru” p 463, pl 161; and exhibited in El Museo Oro del Peru. Provenance: Private NJ collection, Acquired from Harmer Rooke, 1980s.